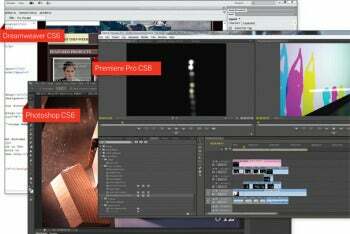 Creative Suite 6's three major applications: Dreamweaver, Photoshop, and Premiere Pro. Flash has been the standard for Web multimedia since the term "multimedia" arrived. Estimators say that 98 percent of the world's computers have Flash installed on them, whether they're running Windows, the Mac OS, or any other operating system, and no matter which browser they're running. So if you're the company that enjoys owning such a popular standard, you should focus all of your efforts on ... steering everyone away from it? Of course, Apple's refusal to run Flash on iPhones and iPads hastened Adobe's course change. Furthermore, Adobe's transition away from Flash isn't entirely sudden; it offered many HTML5-based features in last year's Creative Suite 5.5. But its shunning of its own kind in CS6 is shocking--and admirable. Think of any other large company in charge of such a standard: Would it try to reinforce its monopoly, or would it recognize the sea change before it happened and join the revolution? Perhaps that's overselling what Adobe is doing--but just think about how Microsoft has acted with its Internet Explorer. As a whole, Creative Suite 6 comprises 14 separate applications grouped into four major software bundles, some with enhanced versions: Design Standard ($1299), Design and Web Premium ($1899), Production Premium ($1899), and Master Collection ($2599). Nearly all of the CS6 apps can also be purchased individually, at varying prices. Separately, Photoshop (Adobe's image editing standard) is $699, Premiere Pro (video editing) runs $799, and Dreamweaver (Adobe's Web development platform) costs $399. Creative Suite 6 is full of technological triumphs, from the use of GPU acceleration in Photoshop CS6 and Premiere Pro CS6 to the ability of Dreamweaver CS6 to output smartphone apps for almost any mobile operating system by transferring their production to the cloud.